Material is partly adopted of the Internet. Medical vegetable plant, therefore behaving to the lotus is needed as to acknowledged modern medicine to the medical vegetable plant. 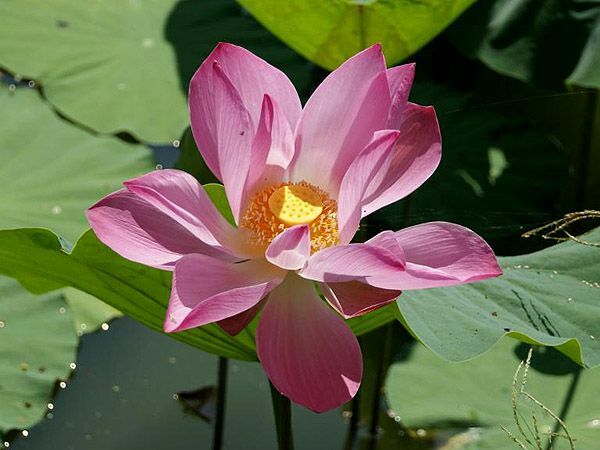 With a medicinal purpose all of parts of lotus are provided (garden-stuffs, petals, flowers, root, leaves). It is necessary to conduct collection before dawn, to the complete opening of flower. Exactly flowers are most fragrant at this time. Gather pick a plant is needed careful, avoiding damages. For making of buddhistic rosary of mala use the large seed nut of lotus. 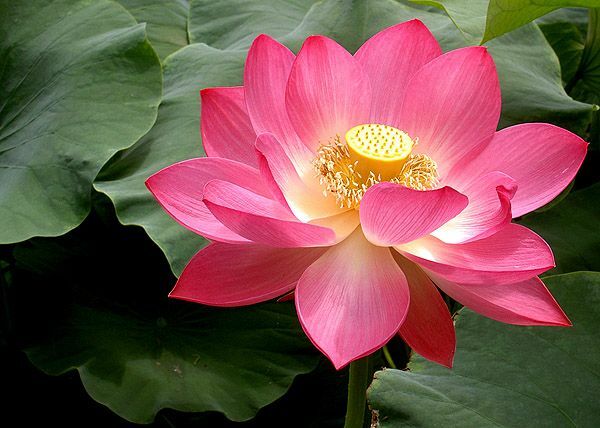 At the people of Ancient Egypt, China, India, Japan a lotus is the object of worship. 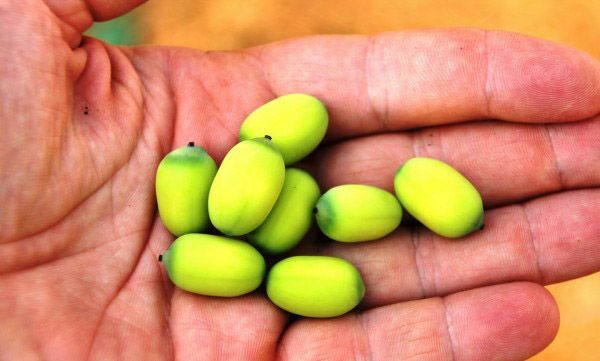 From seed nut of lotus, growings a size with nut, sometimes do a rosary - on one complete is buddhistic rosary lotus mala of 108 beads 4-5 complete small fruitcase bolls of seed nut of lotus are needed (seed of lotus by a size with nut). Seed (nut) of lotus from old times are considered the most useful part of vegetable plant due to general health-improving, restorative and cardioactive properties. 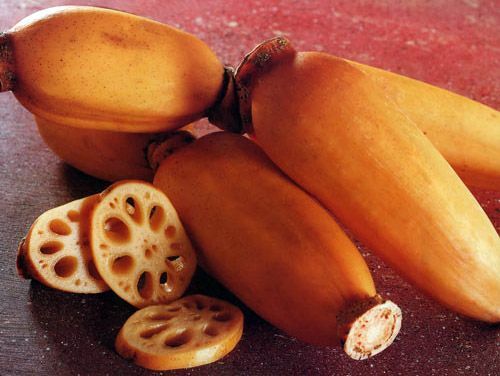 Seed (nut) of lotus is used in treatment of kidneys and cardiovascular system. They possess a sedative action, due to what used at stresses, insomnia, power mental workloads. The newest researches found out ability of chemical components of lotus resorb neoplasms (new growth), that does possible his application at treatment of cancer diseases. Essential oil of lotus, due to a floral exotic aroma with the easy faint notes of spicy herbares, is used in perfume industry for creation of perfumes and fragrant soap. Natural oil has a light-yellow color and transparent consistency. The lotus petals (as vegetable flower plant) are make in herbal tea. A lotus is a water perennial. Like the representatives of vegetable family of water lily Nymphaea (Nymphaeaceae) - water plant, a lotus is rooted on the day of freshwater reservoirs, and his large, on the average, 60-centimetre leaves float on-the-spot water or overpeer above it. Leaves and flowers appear from tuberous rizomy which is rooted in silty soil on a day. Leaves are covered water-repellent waxen coating. When aquatic sparks get on a sheet, water forms round drops, they rolled on the surface of sheet. A lotus can germinate through 300 meter water column. During a day the flower of lotus follows by a sun, turns to him. 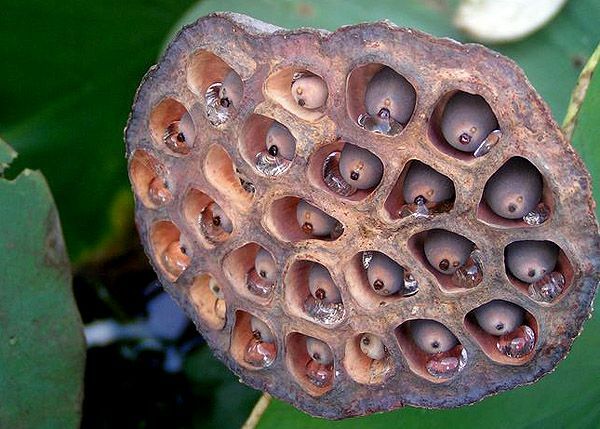 Seed (nut) of lotus are formed in a cup. A lotus is character of veritable religious faith. Many ages on the East it was worshiped a lotus, he had occupied an important place in religious ceremonies, legends and legends. Myth-ethical tradition of Ancient India presented Earth as giant lotus, blossoming out on-the-spot waters, and paradise - as a lake, becoming over rose lotuses, where the just, clean souls dwell. 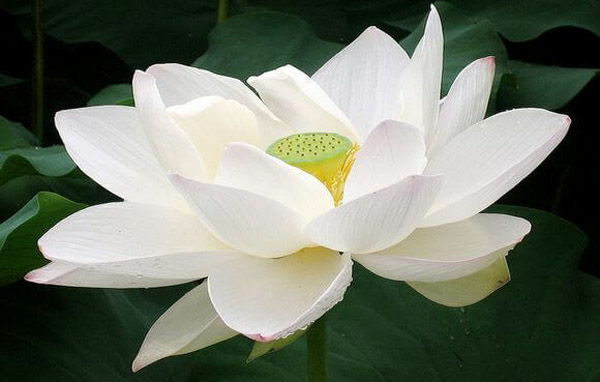 A white lotus is a necessary attribute of divine power. Many gods of India were represented standings or sittings on a lotus or with the flower of lotus in a hand. Man's beads from a lotus popular. A lotus is a flower of lotus, symbolizes nature and essence of things and living creatures in to Universe. With a lotus in a fourth hand represent the Indian deity god Brakhma. Indians honour the flowers of lotus as character of youth, they are decorate temples, and god-creator Brakhma is represented on a background a sacred flower. A lotus is important character in the cultural legacy of India. 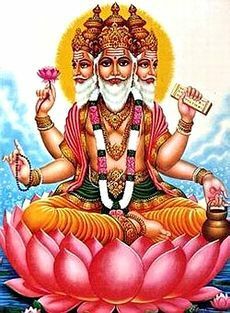 He is mentioned in all of Hinduistic scriptures and is sacred for all of gods. Gods Brakhma and god Buddha is represented sittings on a lotus. 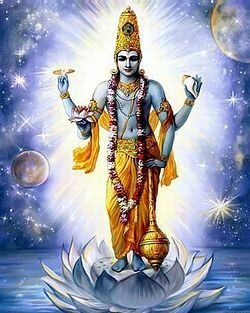 God Vishnu hold a lotus Nelumbium in a hand. A lotus is character of independence and dissociated from all what be going on in outward things - be that bad or good. 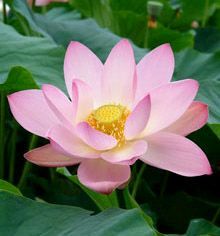 Lotus, or water-lily, it is a water vegetable plant with wide floating leaves and bright fragrant flowers which grow on flat shallow water. The flowers of lotus have a great number of petals which form an interesting and proportional design pattern. Lotuses, reposing on-the-spot pond, subjugate the quiet beauty and grandeur. The Indian poets used appearance of lotus for laudation feet gods. In Vedas there is a great number of the Indian hymns, glorifying a lotus. Chinese are convinced: this flower grows not only on earth but also on sky, in to paradise Eden (Elysium, the City of God). Lotuses, beautify decorating paradisial Eden lakes, are the souls of people (and spirits souls of the dead). Lotus. 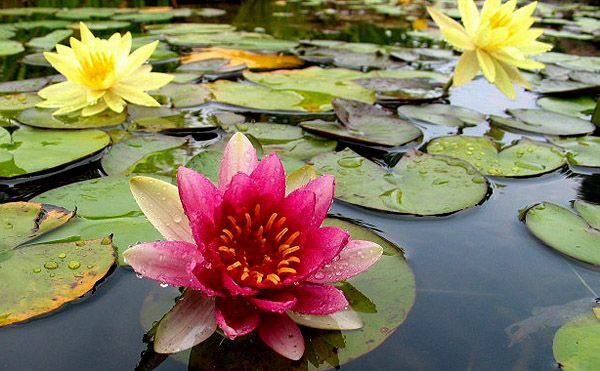 Sonth heat-loving aquatic plant with beautiful large flowers on water. A flower and bud of lotus from the old times considered brightening character. Beginning the way on the silty day bottom of the of lake, the bud of lotus moves upwards through turbid waters, arrives at the smooth surface of water, and, finally, attaining light and air, open exposes the magnificent bewitching flower. Similarly and the soul and spirit is freed, passing a way to Truth. South-east type of warlike rosary (beads). 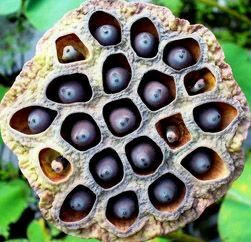 Seed (nut) of lotus appear in a cellular cup, which reminds the small box of somnolent poppy, decorated from above a round flat ground with openings for seed (nut) a form: every seed, having a conical shape, is disposed in the separate cell. A small box with seed also reminds a burdock. A seed-case dry as much as ripening, at first bends the head to water, and then unstucks from a stem and falls in water. 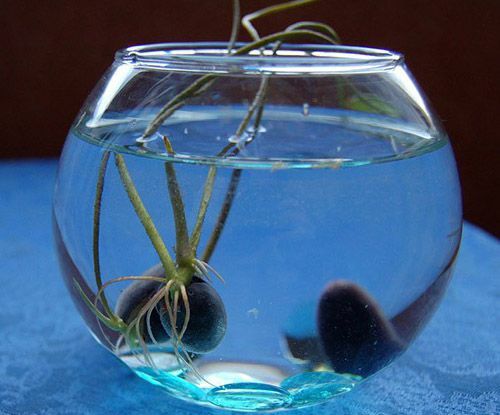 Thus, seed pour out and float on water and, gradually swelling, germinate next in spring. Seed (nut) of lotus very vigorous. 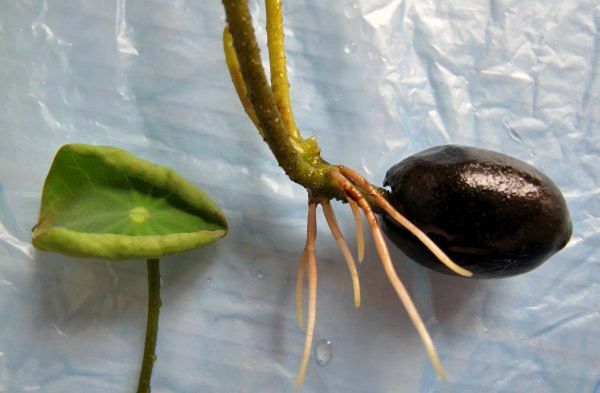 Cases are fixed, when scientists found 1000-years-old seed nut of lotus, and they successfully germinated on good soil. Due to these properties a vegetable plant lived so long to our days. A lotus is good preserving agent. The most widespread types of lotus it is been: lotos nut-carry (Komarov Lotus), or Lotus of India - Nelumbo nucifera, which grows in north-eastern part of Australia, on the islands of the Malay archipelago, island Sri Lanka, on the Philippine islands, on the south of Japan, on peninsulas Hindustan and Indo-chinese, in China. Flowers at this type of lotus are large, to diameter 30 sm, with numerous rose or white petals; lotos yellow, or Lotus of American - (Nelumbium lutea) American lotus, which meets in North and Sonth America, on the Antilles and Hawaiian islands. Leaves air above-water at a plant, on a high petiole (about 1 mcode in a height), diameter about 70 sm. Flowers are yellow or cream. It should be noted that they are more fragrant, than at the lotus of Indian. To midday petals close up in a dense bud. So repeats oneself 4–5 days, and then petals fall off. 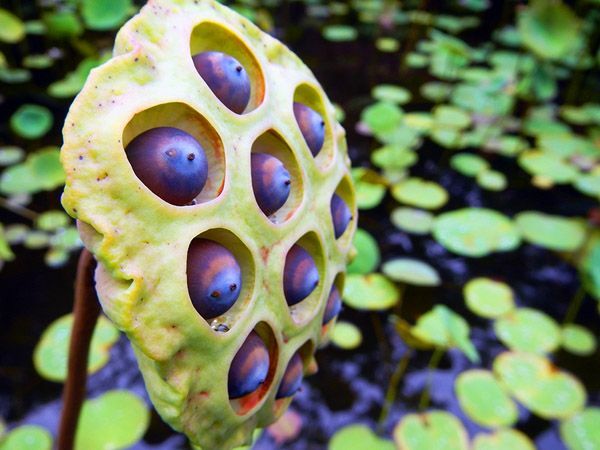 The ripening seed nut of lotus pour out in water. Flexibility of stems of lotus (it is possible strongly to twist up and stretch them, but it is very difficult to tear to pieces, as they consist of strong and flexible fibres) in China is compared to inseparable continuous of bonds of true love which links the hearts of selflessly loving people forever, as much did not take their circumstance of life from each other. The leaves of lotus collect fresh and young without petioles. A root needs to be collected not fully, but to abandon his part for further reproduction propagation. It is necessary at once to wash down a root from sand and silt, and dry under a sun for the maintainance of his properties. Flowers and leaves of plant dry in shade outdoors. For the maintainance of medicinal properties it is needed to avoid the hit of sunbeams on raw material. A lotus blossoms out with the offensive of dawn and closes the petals with setting of sun. Therefore for sages a lotus always was unique character of opening of spiritual qualities of timber-toe by appearance of sun light. Surprising quality of flower that even sprouting in turbid water, he remains unpolluted. Therefore simultaneously with spirituality lotuses symbolize the cleanness of mind and heart. A sixth chakra is represented with a lotus in the foundation. In such direction of buddhism, as Mahayana (the Lotus Sutra), it becomes firmly established that all of the souls happened from lotuses. Yogis are taught the pose of lotus. Visualize the power system, they present chakras (power energy centers of the nervous system of human) as flower lotuses of different colors, with the different amount of petals, turned upwards or downward. In India the variety of lotus with rose-red flowers, covering the valleys of the river Gang, serves as the emblem of divine perfection and spiritual development of people. "Lotus sutra" - one of early texts of Mahayana, dated 1 century AC (Ante Christum natum). North buddhism, arising up in India and widespread in East Asia (in Tibet, China, Japan) as one of two directions of buddhism. "Great way", "Great chariot" ("Great Vehicle"), from 2 century it is a north buddhism; mahayana appeared more flexible, than severe and selfless Hinayana (the Southern Buddhism), it adjusted to the local terms and spread, engulfing Middle Asia, Tibet, Mongolia, China, Korea, Japan), the Mahayana (Buddhism), the Northern (Later) Buddhism, China-Japan use of Daijo. Chemical composition of lotus is various and to the not end studied. 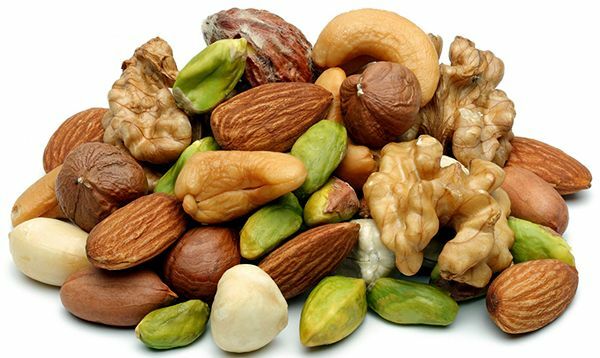 It is known that there are a few types of flavonoids in a plant, such as nelumbozid, Quercetinum, hyperoside, astragalin, izoramnetin, leukoantocianidine, alkaloids - lotuzin, dimetilkoklaurin, neferin and nuciferin, organic acids, fats, peptids and carbonhydratess, tannic matters, resins. Seed (nut) of lotus are rich in maintenance of mineral matters (potassium, zinc, magnesium, iron). In composition the seed nut of lotus found out the flavonoid of kempferol, which possesses a anti-inflammatory action. Harmonizing and sedative preparation. The use of dishes on the basis of seed nut of lotus strengthens immunity and normalizes the reproductive system. Due to maintenance of tannic matters seed show an astringent effect, that allows them to use in treatment of piles and diarei. 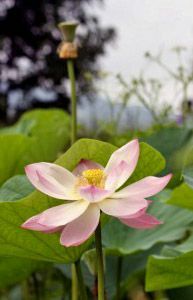 The root of lotus as decoction for a long time was used folk medicine of the East as an effective sedative mean at cramps, pollakiurias and dyspepsia. Due to the food value of such decoctions they were often recommended during strong exhaustion or moral exhaustion. The stamens of lotus are used for treatment of diseases of heart and buds. The stems of lotus are used in therapy of diseases of gastrointestinal tract and respirator system. The extract of plant enters in the complement of modern cardiologic, vasorelaxant vasodilatory, styptic and febrifuge facilities. Decoctions and extracts of lotus are shown by febrifuge and diuretic properties. Preparations on the basis of plant apply in treatment of diseases of gastroenteric highway, buds and liver. Healthful properties are possessed by oil of lotus, terminate inflammatory processes and clearing a derma cover; instrumental in normalized out of derma and used in treatment of acne diseases. As well as in medicine, in cookery use all of parts of plant. In Thailand of stamen and petals of lotus are making lettuces and desserts. From the root of lotus make a flour and stove bread. Paste from roots is added as ingredients at preparation of soups, kidney bean, noodle. The young leaves of plant are added to lettuces and vegetable dishes. from seed nut of lotus make various desserts and porridges. 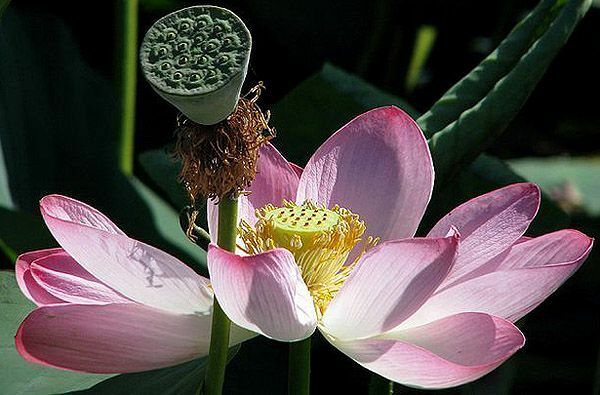 The use of seed nut of lotus is widespread in China: they are purged from a derma and eat, as candies, obvalyannye in sugar, cook a cachou, prepare coffee drink from them. To liking the seed nut of lotus remind a nut. Sweet paste from seed nut of lotus is added as filling in baking, and the candied seed are part of traditional small box of sweetnesses, which daryls on Chinese New Year. 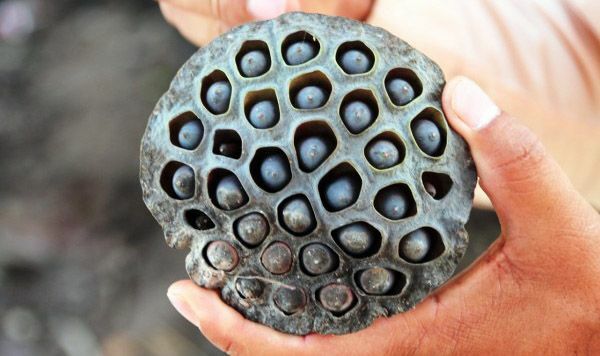 American Indians from old times used the rhizome of the American type of lotus Nelumbo petapetala in a ration. Did not go round him attention and animals: elephants and other wild beasts use the green stems of plant in food. The wide leaves of lotus use as a wrapping paper on markets and markets; young leaves cook, fry, prepare on a pair, add to the vegetable dishes. In respect of flowers of lotus, they possess interesting property - save relatively a stable temperature in independence from an ambient temperature and during a heat used as a dish with "coolings" properties. Warning: not use a plant, if it is necessary to conduct a car or work with some dangerous equipment! Not use in mixture with some psycho-active and cardiac medical preparations, and also, if you have signs of depression, some other psychical disorders (schizophrenia and manic-depressive psychosis), if you are pregnant, or feed a child! Most popular application of Rose Lotus - in mixture with other enteogenami. Gives excellent results at adding of petals of lotus flower to different drinks. Calorie content of the dried seed nut of lotus on 100 g - 332 kkal. In mythology of people of the East a lotus, growing in itself among primordial chaos, symbolizes the center of the universe. 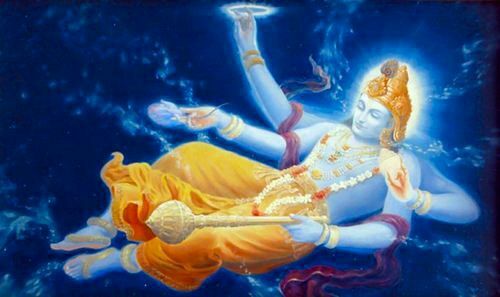 In obedience to a Ancient Indian myth, a divine giant lotus, growing from the belly-button of great god Vishnu, resting among shapeless primordial waters, unstrung thousands of shining fragrant petals from which as much as their growth and Universe appeared. 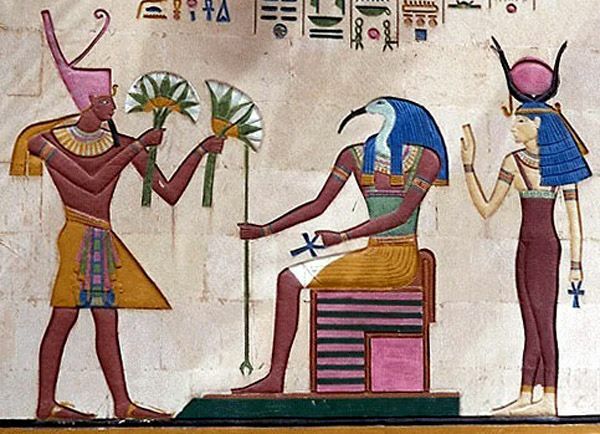 On a Ancient Egyptian myth the flower of lotus served a cradle to sun god Ra. In a burmese myth told about that, how from the flower of lotus, sent on earth gods, the World mountain of Loysaomong - central pillar of Universe rose. There is a lotus in the Chinese buddhism - one of Eight kind signs, embodiment of sincerity, firmness, decision, domestic harmony and prosperity. Great Homer told in "Odyssey" about the hospitable mythical tribe of lotus-eater (to the tribe of "devour of lotus"), inhabiting territory of ancient Libya. Sputniki of ingenious is Odyssey (did not ride east and did not know about a lotus), tasting honey-sweet lotus, submerged in beatific oblivion, losing every memory about the pas and flashbacks about a distant motherland. I reign Itaki had to be applied force, to deliver them on ships, whereupon the heroes of Ellady (To Greece) hastily abandoned dangerous in the cordiality of lotus-eater. Legend about lotus-eater arose up not on blank space. Ancient Egyptians counted a white nilotic lotus, exposing the bud only at nights, by character of sleep and sweet oblivion, and Chinese and Japaneses in Asia use the candied lotus counterfoils of nut-carry lotus in food, supposing that such divine product is able to prolong youth and save beauty. In religion of Ancient Egypt the most essential role was played by a not white, but blue nilotic lotus (water-lily, other family), blossoming at dawn and closing bud on sunset of a sun. 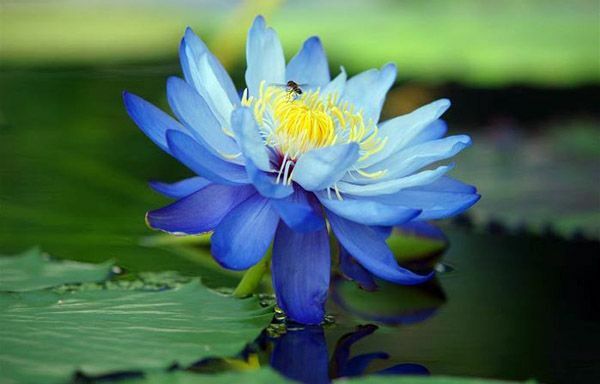 Unlike a "nightly" white lotus, his blue (and more precisely, blue-dark blue) colleague-water-lily symbolized awakening and reviving, therefore ancient Egyptians decorated garlands from the blue lotus (blue water-lily) of tomb and sarcophaguses. A lotus is mixed up with water-lilys (Nymphaea, in particular with the White and Blue lotus). A lotus and water-lilys of water-lily is practically unconnected. A lotus and Nimfeya are the members of different orders (Proteidae olm and Nymphaea water lily spatterdock accordingly). A lotus is Egyptian (Nymphaea lotus) is a white water-lily. He is a lotus. There is a lotus on the name, and in business the Egyptian white water-lily. Water perennial. Tubers are oval. This type of water-lily has flowers lilies which float on water, and flowers which rise overwater. The color of flower is white and accented rose. He grows in different parts of East Africa and South-east Asia. Left to America. Romantic dear flower, symbolizing trips and distant wandering, character way road. 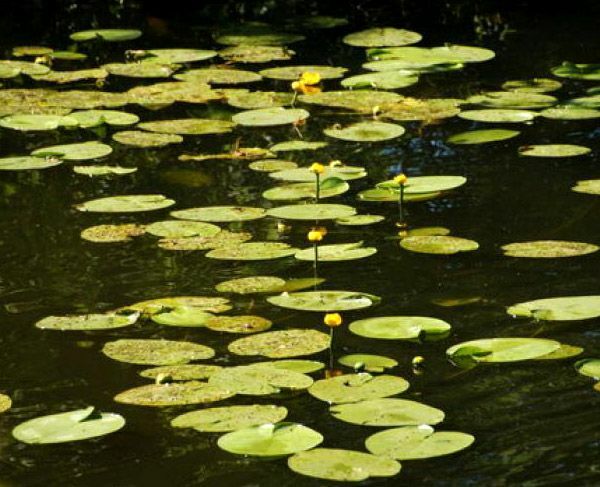 A candock cow lily (Nuphar) is a sort of water perennials of family of Water lily (Nymphaeaceae), widespread on shoal on the banks of lakes and slow-flows rivers or channels. Photographed abroad, although extremely popular in Ukraine, CIS (town Chuguev and river Severskiy Donec especially). A candock cow lily grows and popular including in state Ukraine (CIS) and in the Kharkov region (rivers, lakes, staricy, shallow ponds, opened bogs). Tearing an aquatic flower is not needed - he is guarded, as well as all of similar plants. 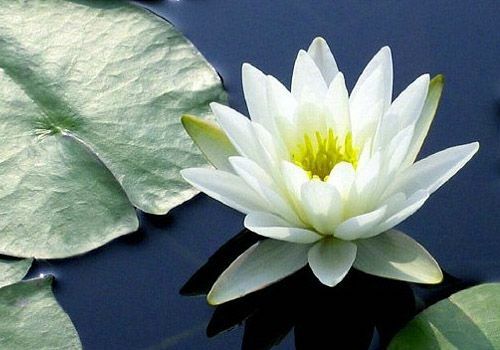 Often a candock by mistake is named a water-lily, here water-lily white (flower of romanticism and trips) name a water-lily - in the Kharkov region it is special popularly. After seed on a buddhistic rosary in the Kharkov bogs also does not climb and similar rare and valuable aquatic flowers do not tear and beloved one's love is not daryls - they are landed and it is admired by them. Candocks cow lily (goldish aquatic water-lilys) name "obruchalka" (rus., church wedding golden ring) sometimes (betrothing of fiance and fiancee, after their illegal collection often catch unlucky fiances and compel them to conduct goldish candockes-water-lilys on ponds). Rosary thought of in economies on growing of lotus and extended this invention on stone, minerals, vervicy, paper (the few knows it). 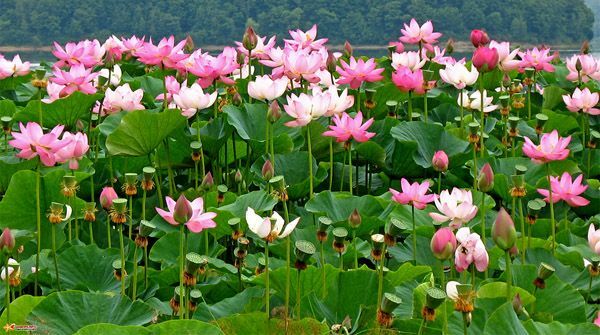 A lotus is widely widespread all over the world, he is actively reared shoal (water-lily). On by volume paper rod the seed nut of lotus emerge, on cantledge from stone the seed nut of lotus sink well. Seed of lotus perfectly be kept, but, judging to on authoritative sources of the Internet, it is very heavy couch and rear them. Stone crack, file, chip and work. 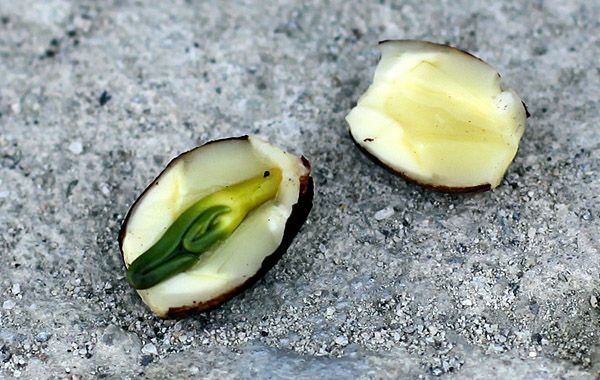 Seed of lotus extraordinarily look like edible olives, nuts (they are eaten in a raw and pickled kind) and simply pebbles (about them teeth break is obsidian, grey jasper and alike stone), and couch and in the process of germination the seed nut of lotus are alike on exotic insects. A "flower of the opened heartiness" is a lotus. On territory of Russia (CIS) a lotus meets in three places: on the banks of the Caspian sea in the delta of river Volga and mouth of river Kura, on Far East and in the river Kuban estuaries, on the east coast of sea Azov. In the pool of river Amur a lotus adjusted to the local terms and became a frost-hardy plant (Komarov Lotus). 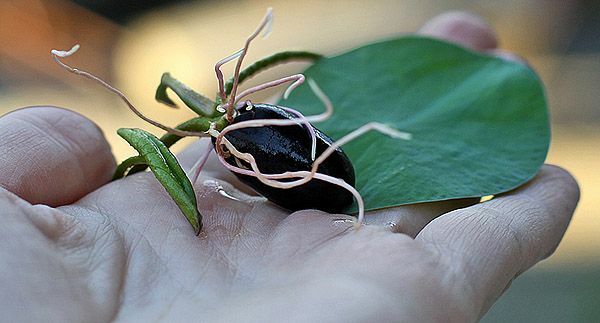 A lotus propagates oneself either rhizomes or seed - by large nuts, covered thick pellicle (make an incision crack a nut of lotus - he becomes look like the marinated pickled olives). As a medical vegetable plant a lotus was known in China a few millenniums prior to a new era. In traditional Chinese, Indian, Vietnamese, Arabic, Tibet medicine for preparation of medications used all of parts of plant are seed wholly or their large farinaceous embryos, receptacle, petals, peduncles, stamens, pestles, leaves, roots and rhizomes. In a vegetable plant found out different bioactive matters, mainly alkaloids and flavonoids. Preparations from a lotus are used as a soft restorative, cardioactive, general health-improving mean. In addition, a lotus is a valuable food and dietary plant. In the countries of South-east Asia he is used in a feed and specially rear as a vegetable. Rhizomes eat in by cheese, boiled, fried kind, pickle on the winter. From roots cook soup, get starch and oil. Young leaves use in food like an asparagus. Seed eat raw and candied as a delicacy, sugar the pieces of rhizomes - fruit "jellies" turn out. From seed and rhizomes prepare a flour. Eat stamens and stems even. For growing of lotus recommend to dig up a pond (or to do an unrunning dam). Minimum the possible sizes of reservoir must make a 3х3 meter. 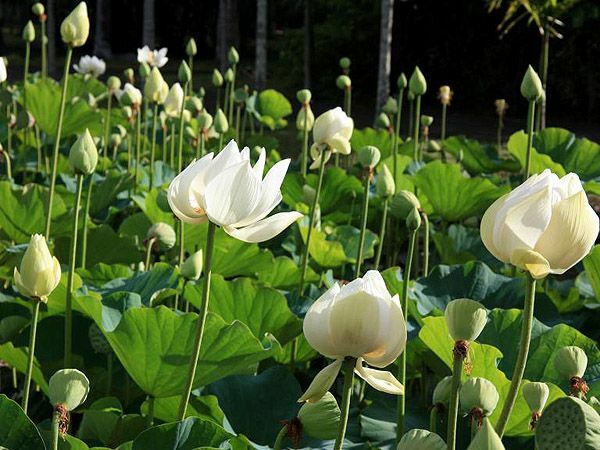 In a less lake the layer of silt from which a water level gradually will diminish and lotuses can winterkill in winter will accumulate from dyings off and falling on a bottom leaves and flowers of lotus. A minimum depth of reservoir is 70 sm. An optimum depth is 1 m. Better, if you will begin to dig a pond in shade of branchy tree. The winter of his branch is protect a lotus from winterkilling. 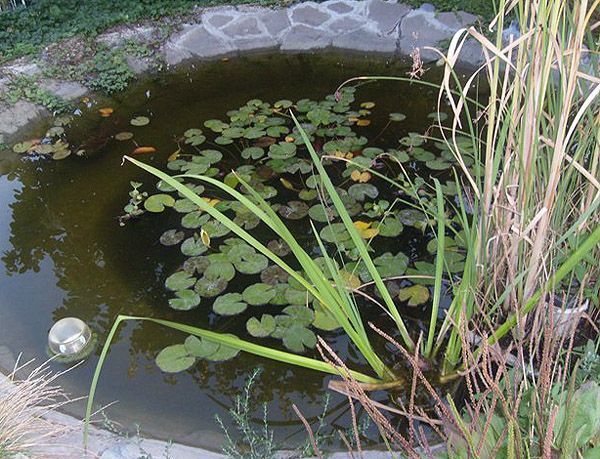 It will be necessary regularly to clean a reservoir from a duckweed. 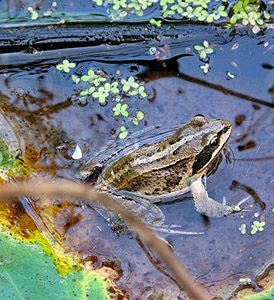 You will start frogs in a reservoir. A lotus grows in water. Seat, collect and work lotus by hand. On a photo with two seed a sharp end is rotined seed nut of lotus – does NOT SAW HERE! It is an interesting pair of pictures of lover to rear lotuses, showing, from where take material for a lotus rosary. It is both-side seed nut of lotus. Usually file them from one side, thus easily to entangle sides. It is possible file the seed nut of lotus without clarification, from what part he is sawed, and then to take away suitable for sowing and to land. 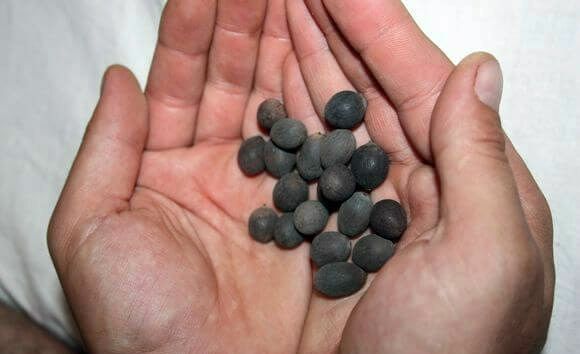 Other seed are used on a rosary (them also try to plant - for you can couch even rosary from seed nut of lotus, if you lost them in a successful for the germination of lotus place). On a probability theory, an about half leave casual appearance of podpilennykh seed nut of lotus on making rosary - file them from other side, and a half is landed in earth and reservoirs. Seed for a rosary contain embryos of lotus and can in a moist warm environment and in water or to decay, or prorasti. Not room plant. Another recommendations. 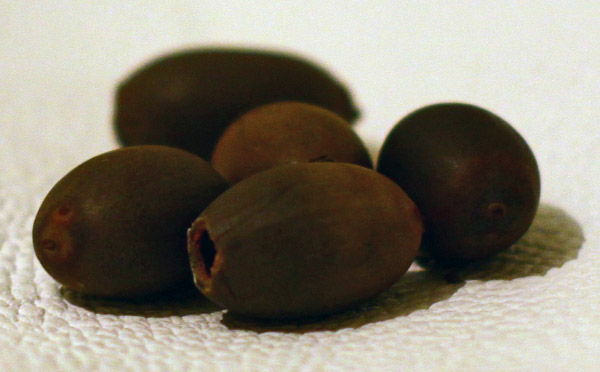 The seed nut of lotus prepared to reproduction look outwardly like small grey or black nuts. They are the same hard and have woody very durable pericarp. Their size: height approximately 1,5 sm, diameter 1 sm. That the pip of lotus climbed, him scarify. It means, from a dull end (where fossula) file him on an emery-wheel. It is possible to use rough sandpaper, so quick and simpler. On appearance of the first counterfoil leaves approximately 5 days. From a rosary lotuses do not rear usually - seed order specially, but chances are every (probability of casual germination of the lost or forgotten rosary from seed nut of lotus in water or moist earth - about 1%). Water can be permanent warm, but not especially hotter, not to cook seed. Not lose and not cook a rosary !!! 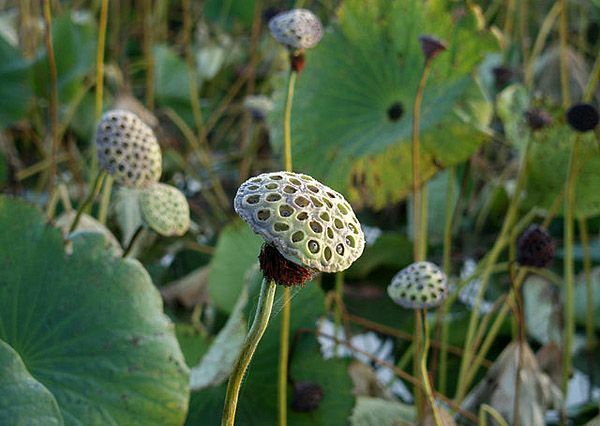 A Komarov Lotus (nut-carry lotus) is a surprising plant with large rose flowers and powerful foliage on the surface of water. It is talked, it is they are of the same age dinosaurs. 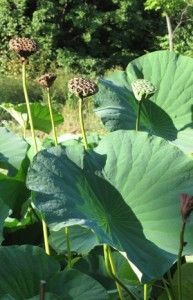 To cultivate make multiply an nut-carry lotus in the nearest lake or to the pond - simpler, than can appear (especially if you meditated with a rosary on lotuses, they by chance were crack up and forgot the crack rosary on moist summer heat of the sun, in the full blaze of the sun). 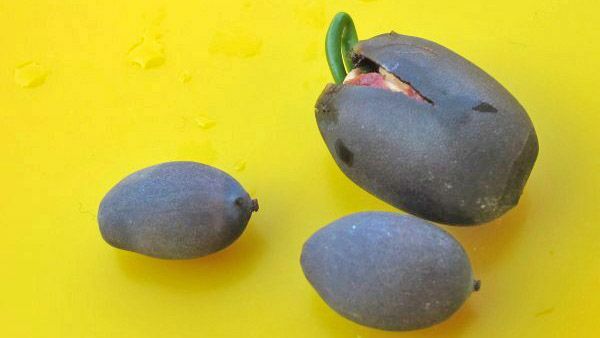 If seed nut of lotus of sprout shoot, they become much larger. If the seed nut of lotus got in a successful environment and chipped, they will go down on a bottom, after the pair of days nuts will become larger and bugristee, will emerge then, after again will go down on a bottom. In 4-7 days pericarp will burst, and a thin green "hook" – germ plantlet will appear on light. He grows very quickly, and soon begins arise the second. So a lotus grows. Not engaged in greensprouting of rosary usually - separately buy seed Komarov Lotus. "Lotos-japam-mala" is rosary from seed nut of lotus are a reminder about prayer, united in a ring - about continuous prayer. Sorting out of rosary also allows practicing to save attention, contest with the loss of concentration and sleep. In some practices rosary from different materials of doctor-litotherapy provide with ability to cure one or another illnesses. In addition, difficult motility of fingers, sorting out a rosary can help at treatment of illnesses and joints of hands. Reflexology, exact point and muscularly-tendon massage of hands (seed are fragile, not to trample down). In Ukraine (CIS) a rosary also love simply as jewelry - any.